Beauty is one of human desires. Tight skin without wrinkles, elimination of veins that look like defect on the flawless skin, removal of unnecessary hair and lightening melasma are major concern among contemporary women. Most dermatologists are purchasing laser devices, as well as skin care devices, to handle these issues. As such devices are not very cheap, the cost is too expensive to buy all devices for every lesion, and it is another problem to make use of all purchased devices. Various devices are required to solve big three culprits, which are wrinkle, vein and hair removal. 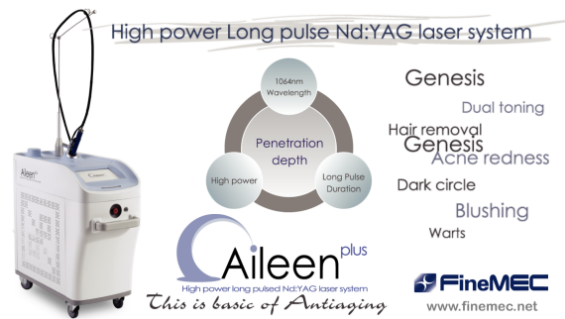 However, high power Long Pulse Nd:YAG laser, Aileen is a breakthrough for better efficacy with less cost. Long Pulsed Nd:YAG laser is a multipurpose laser that can be used for hair removal above all, but for skin rejuvenation and vascular lesion as well. This laser has deeper infiltration depth and higher energy output compared to other lasers, allowing for more effective procedure. Even on the same energy, the range and depth of action on follicles may vary depending on the spot size. Larger spot size allows for more effective and rapid hair removal. Aileen is equipped with maximum 15mm spot size and corresponding energy output for a dramatic hair removal effect. One of the advantages of vascular treatment with Long Pulsed Nd:YAG laser is the fact that it can be applied to every visible size of vessels. It is commonly used between 2-4mm spot 250-450J, which can produce immediate loss of blood vessels. Erythema and edema are accompanied for 2-3 days, which is why cooling is essential after the procedure. It has particularly excellent effect for the treatment of recurrent vascular lesion from rosacea on the nose. Vasodilation of 2mm or less due to varicose vein can be removed by 1-2 course(s) of treatment. With high performance power supply and chiller system, Aileen can produce stable 100J MAX energy. It is effective for dermal collage remodeling by heating the dermis to more than 50℃. The laser module, optic components and handpiece are all made in the US for relatively powerful performance. Throughout my experience of using various long pulsed lasers, Aileen can be rated highly for its easily adjustable spot size, 15mm beam size and high energy output. In the past, one of the most frequently used modes of Long Pulsed Nd:YAG laser was the Genesis mode, in which the laser beam penetrates the epidermis and acts on some melanin and hemoglobin as well as heating the dermis directly. Even though genesis technique was promoted in the past as having a superior effect for pore treatment, the actual effect was meager, rendering it scarcely used with time. However, with the recent introduction of new parameters for existing lasers and the development of new high output lasers, Long Pulsed Nd:YAG laser is gaining much popularity again in dermatology. It can provide overall improvement from a slight whitening to rejuvenation for better skin elasticity, less wrinkles and reduced capillaries. For a proper treatment, constant energy of more than 20J/㎝ should be irradiated uniformly at 10Hz with 7㎜ spot size. It is recommended to irradiate at least 3,000 shots on the one side of the face and then continue to the other side of the face. Flushing with vasodilation can be significantly improved after 2-3 courses of procedure. 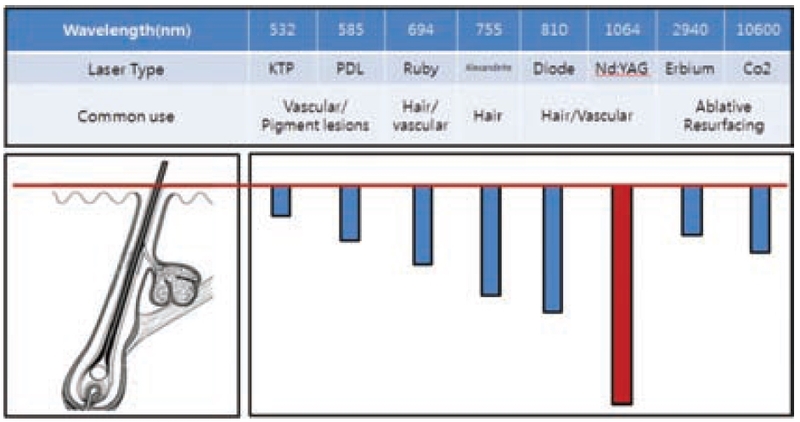 Long Pulsed Nd:YAG laser toning is recommended if a patient with melasma does not respond to the existing laser toning or develops hypopigmentation. Q-switched Nd:YAG toning can be used mainly at first, with a little bit of Long Pulsed toning, and then move the emphasis to Long Pulsed toning after 3-4 courses of treatment. Since Long Pulsed toning is a safe procedure with no risk of hypopigmentation or hyperpigmentation, patients can experience higher satisfaction.